Winter tyres could help keep company car drivers safer in treacherous road conditions, a test conducted by Volvo has shown. 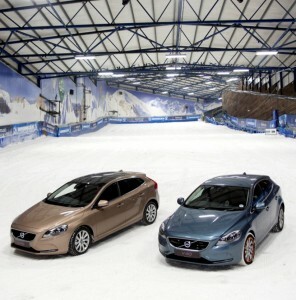 Two identical Volvo V40 D2s – one on standard tyres and another on winter tyres – visited the Tamworth Snowdome and attempted to reach the ski slope’s snowy summit. An amateur driver tested both cars back-to-back for a snow driving test intended to mirror the experiences of millions of motorists this winter. The test was then repeated using snow socks – a low-cost, temporary alternative to winter tyres – to see if they could improve the performance of standard tyres in slippery conditions. While standard rubber reached a distance of just five metres, the winter tyres carried the V40 comfortably past the 100metre marker and onwards towards the summit. The winter tyres’ softer rubber compound gripped the surface far more effectively, retaining stability and traction. Meanwhile, the fabric snow socks, which can be fitted in a couple of minutes, enabled the standard-tyred V40 to cruise up the slope. Nick Connor, Managing Director of Volvo Car UK, said: “We wanted to demonstrate, in the most severe conditions possible, the effectiveness of having winter tyres or snow socks fitted to your car. “There’s definitely a degree of scepticism out there about how useful they can be, but this test dispels the myths once and for all. “Fleet managers looking to safeguard their drivers and other road users should definitely consider educating their company car drivers about winter tyres and snow socks. Winter tyres are at their most effective when temperatures drop below seven degrees, and comprise just 5% of all new tyres sold in the UK. Absolutely agree with this. I had winter tyres fitted to our Peugeot 206 SW last winter & it transformed the car’s performance in snow. If you ain’t got winter tyres get them now before the snow comes & you get caught in the rush.